The Bhagavad Gita: Fettered No More by Selfish Attachments — The Contemplative Life. Although not technically included in the Vedas (the earliest and most authoritative scriptures of Hinduism), The Bhagavad Gita may be the most famous text to come out of the Vedic tradition as a whole. 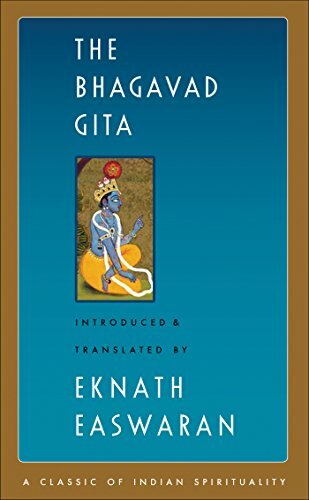 The text itself is embedded within a massive Indian epic, the Mahabharata, but most scholars believe that the Gita was inserted into this larger story by a later editor. The Bhagavad Gita is most often pulled out of the Mahabharata and read alone as a complete document in and of itself. The author of the Gita shares the common Hindu metaphysical view that at the core of every human being lies the Atman, a spiritual absolute, or "God in us." Furthermore, this divine core of humanity is one with Brahman, the Divine Source of Existence. From the perspective of the Gita, it is by realizing this experientially that the spiritual seeker will attain their ultimate goal. Throughout the Gita, Krishna – an incarnation of God – leads Prince Arjuna through his own spiritual battle, counseling him on how to "realize the Self," or find Union with God. This series will include quotations from a translation by Eknath Easwaran. His introductory remarks alone make this version worth buying, and his ongoing commentary throughout the work is illuminating. I don't think there's a more valuable commentary on the market. Arjuna: "Tell me of those who live established in wisdom, ever aware of the Self, O Krishna. How do they talk? How do they sit? How move about?" Krishna: "They live in wisdom who see themselves in all and all in them, who have renounced every selfish desire and sense craving tormenting the heart. Neither agitated by grief nor hankering after pleasure, they live free from lust and fear and anger. Established in meditation, they are truly wise. Fettered no more by selfish attachments, they are neither elated by good fortune nor depressed by bad. Such are the seers. Even as a tortoise draws in its limbs, the wise can draw in their senses at will. Aspirants abstain from sense pleasures, but they still crave for them. These cravings all disappear when they see the highest goal. Even of those who tread the path, the stormy senses can sweep off the mind. They live in wisdom who subdue their senses and keep their minds ever absorbed in me. ...They are forever free who renounce all selfish desires and break away from the ego-cage of 'I,' 'me,' 'mine' to be united with the Lord. This is the supreme state. Attain to this, and pass from death to immortality." The themes of being free from attachments, and steady in the midst of both success and defeat, will return throughout the Gita. The seer who is established in the Self has nothing more to gain from the world. He has found his ultimate fulfillment and is thus untroubled by, and unattached to, the things, experiences, and events of the world, whether good or bad.